Whooga Ugg boots: competition winner and discount code! Once again, this turned out to be a popular competition! The prize: free run of the Whooga Europe online store, to select the style, colour and size of your prize boots. Congratulations Jane: I’ll email for your address details, and we’ll get your boots sent out pronto. Thanks to everyone who entered. A Whooga Uggs discount code, especially for Miss Thrifty readers! It’s valid for the next 14 days, expiring on 3 November 2011, and gets you 10 per cent off. The boots are already discounted, so all in all it’s a good deal. 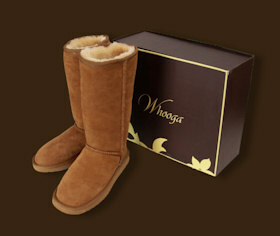 When you visit the Whooga Uggs online store, just enter the code at the checkout. I’ve just found that I’m a winner from looking through your website. I’m sorry I must I missed the email. I hope I’m not to late to claim my prize.